With the appointment of President Trump’s cabinet, many citizens expressed their disappointment through protests and rallies. Omaha was not an exception. When Betsy DeVos was named Secretary of Education, many students and educators at Central expressed their disdain with DeVos and her ways of thinking. On Feb. 3, over a hundred Omaha citizens protested outside of Senator Deb Fischer’s office. Fischer had previously expressed why she supports DeVos via twitter, which sparked anger across social media, thus leading to the protest. Amongst protesters were Central students themselves who were upset by Fischer’s acceptance of someone who they deem unfit for the position of Secretary of Education. Although most Republican senators were expected to show their favor for DeVos, many Omaha citizens hoped that Fischer would disapprove of DeVos’ view of public education since her mother was a longtime teacher in Lincoln Public Schools, but as Zahm said, this was not the case. Amongst the protesters were a variety of people. There were several teachers, parents, kids and students. 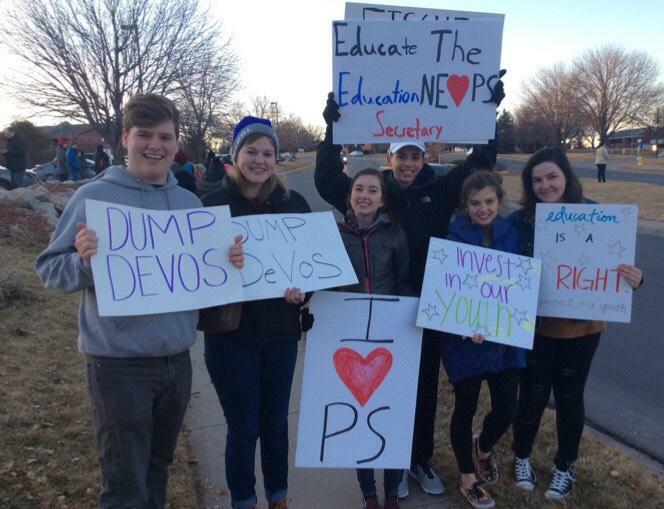 Zahm and other Central juniors went to the protest because as public school students, they disagree with DeVos’ opinions on public schooling. “I was with my girlfriend Audrey Holbeck, Bri Tuttle, Nick Koehler, Anna Kaminski and Anne McElyea,” Zahm said. DeVos did not attend a public school herself, and this may be a factor as to why some believe she does not support public schools. In addition, she supports charter schools. Charter schools are still public schools, though they are privately managed, and can be started by almost anyone, therefore they don’t have to follow state regulations the same way regular public schools do. The parents of the student chooses the specific school for their child to attend. It is argued that these schools are nice because it allows for alternative learning techniques and ways of thinking for the student. Charter schools also may lose funding or even close down if they don’t meet a certain quota when it comes to standardized testing, and this is appealing to parents because it means that the teachers will have more incentive to make sure that their children improve. On the other hand, there are those that argue that charter schools rob funds from other schools because they are funded with tax payer’s money, and the kids who don’t go to charter schools are left behind because of their districts budget. According to The School Superintendents Association, it is also argued that charter schools are elitist and cater to kids who are more fortunate, financially or intellectually, than others. The argument of charter schools is why many protesters were present outside of Fischer’s office. But apparently, there was another pressing issue about DeVos that protesters disagreed with. Zahm claims that this is dangerous because this generation of young people has a large percentage of those who identify as LGBTQ+, and having a Secretary of Education that holds values opposed to the majority of students is not sensible. For these reasons and other nameless reasons, approximately 200 people protested. They believed they were standing up for their rights and helping to change what they deemed unjust. Protesting in public is one way to bring about change, but there are countless other ways too. Social media, writing letter, phone calls and more are all ways to raise awareness and bring about change.